BSNL Notification is out. BSNL is recruiting for 198 JTO Civil And JTO Electrical Govt Job Posts. You can check BSNL - Bharat Sanchar Nigam Limited last date, download BSNL notification, visit BSNL official website and check other BSNL Vacancy details.Complete Vacancy and recruitment Details about 198 JTO Civil And JTO Electrical Govt Job vacancies in BSNL are provided below by JobSarkari.Com only for you. Last Date of Apply Online. 12/03/2019. Last Date of Pay Application Fee. 12/03/2019. Mode of Payment Candidate Need to Pay Application Fee Through Online Mode. Andhra Pradesh 03 03 06. Himachal Pradesh 01 03 04. Jammu & Kashmir 03 03 06. Madhya Pradesh 03 07 10. Northern Telecom Region 01 03 04. North East – I 04 02 06. North East – II 05 02 07. Uttar Pradesh [East] 06 03 09. Uttar Pradesh [West] 01 02 03. West Bengal 09 05 14. Total No. of Post 132. 66. 198. JTO (Electrical) Candidate Must Have Passed B.E / B.Tech or Equivalent in Civil Engineering and Are Required to Appear in GATE Exam 2019. JTO (Civil) Candidate Must Have Passed B.E/ B.Tech or Equivalent in Civil Engineering and Are Required to Appear in GATE Exam 2019. Relaxation For OBC 03 Years And SC / ST 05 Years. 1. Candidate Need to Apply Through Online Mode. 2. Candidate Need to Click on Apply Online Link As Given on Our Website in Important Link Section. 3. Candidate Need to Fill All the Mandatory Details in Application Form And Need to Upload Scanned Copy of All Mandatory Documents. 4. Candidate Can Apply Online On or Before 12th March 2019. Q. 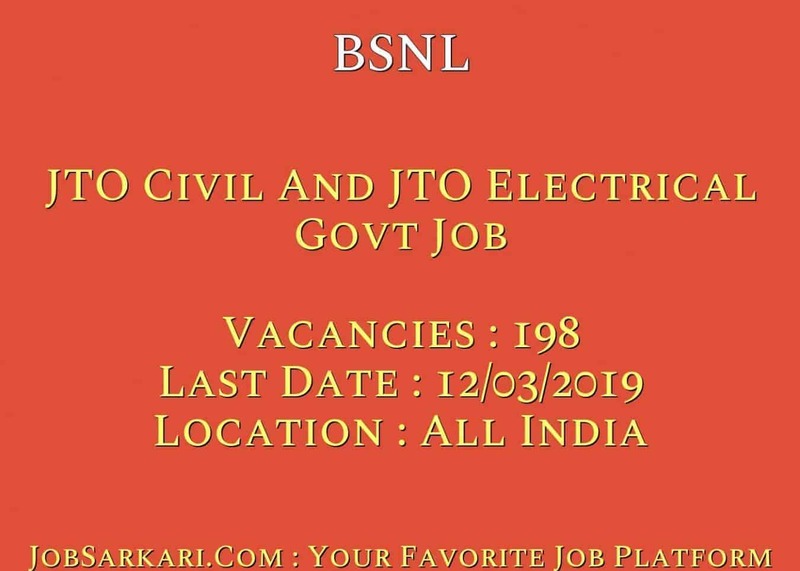 What is the Last Date For BSNL JTO Civil And JTO Electrical Govt Job Vacancy ? A. 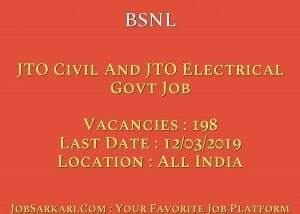 Last Date for BSNL JTO Civil And JTO Electrical Govt Job Posts is 12/03/2019. Q. What is the Form Type of BSNL JTO Civil And JTO Electrical Govt Job Recruitment ? A. The Form Type for BSNL JTO Civil And JTO Electrical Govt Job Posts is Online. Q. How many vacancies are available in Bharat Sanchar Nigam Limited JTO Civil And JTO Electrical Govt Job Posts ? A. There are about 198 Vacancies in Bharat Sanchar Nigam Limited JTO Civil And JTO Electrical Govt Job Posts. Q. What is the Full Form of BSNL ? A. Full Form of BSNL is Bharat Sanchar Nigam Limited .